On-site testing of turns ratio is an important basic measurement for power transformer diagnosis. It helps to detect faulty transformer windings as well as defective tap changer positions. The simple ratio of turns or voltage and related ratio error is not sufficient to detect all possible failures of a power transformer winding. The excitation current and the phase angle between primary and secondary windings give additional information about the winding condition. The TTR 2795 provides all these measurements in one compact instrument. Transformer Turns Ratio Meter TTR 2795 is the next generation of the very successful Tettex transformer turns ratio meter line. This advanced instrument recognizes winding connections and vector group numbers of transformer windings. Just connect the measuring cables and press the start button. In addition, the selectable test voltages of 100V, 40V, 10V and 1V avoid saturation effects on current transformers. Large graphic display shows all data at a glance and displays tap changer results in clear graphic design. Fully automated three-phase measurement of turns ratio, voltage ratio, phase displacement, and excitation current. Better transformer excitation due to higher test voltage. Highest accuracy on the market - up to 0.03%. Ratios of up to 50,000 can be measured. Measurement of phase displacement transformers. Quick setup with intuitive guide-through user interface. Automatic Winding Connection Identification (AWCI) and automatic vector group detection supports quick and easy operation. Safety connection control feature: Proofs test setup before Appling regular test voltage. Light-weight, rugged and compact design. Free external application software allows data exchange, analysis and report generation. 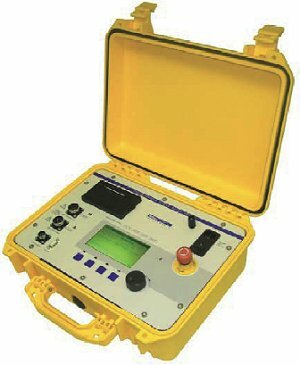 Verification box is used to check the correct functionality of the Ratio Meter and its connected measuring cables. External Tap Test Start Switch - is used for convenient remote tap changer testing.